Do you know what number to dial to get emergency service in the country you are visiting? In 1937, London became the first city to introduce a system where callers could dial a short 3-digit number to get immediate help. They chose 999 as it was difficult to accidentally dial on the old pulse-dial phones. Calling 999 alerted a switch-board operator by sounding a buzzer and flashing a red light. The first 911 system in North America was set up in Winnipeg, Canada in 1959. Nine years later, Alabama and Alaska followed suit bringing it to the US. It wasn't until the 1980s that 911 became a standard under the North American Numbering Plan. There were many obstacles to overcome, such as being routed to the wrong jurisdiction. But with today’s technological advances, almost every single location in North America has an accurate 911 service. . The most useful thing to have in any country during an emergency is a mobile telephone. 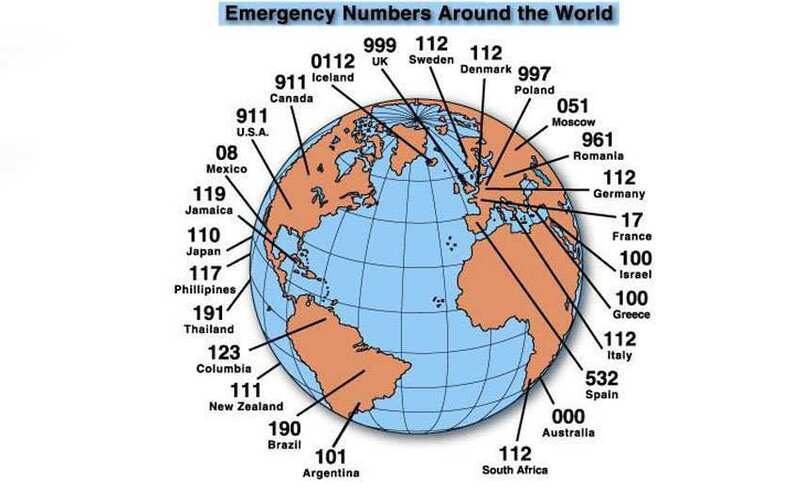 The GSM (Global System Mobile) network uses 112 as a world-wide emergency number. When 112 is dialed from a GSM phone, the network will automatically redirect you to the local emergency dispatch, if it's available. In addition, many countries allow emergency calls to be made from phones without a SIM card (Latin America, however, requires one). Those who can't function particularly well in an emergency might feel more at ease knowing this: dialing an emergency number from most mobile phones doesn't require the keypad to be unlocked. Since 80% of the global mobile market uses GSM technology, it's well worth the extra expense when travelling, if your current mobile isn't GSM. Even if you're traveling with a mobile phone, and definitely if you’re not, you need to know the local "emergency number" of your destination. Write it down and memorize it. Hopefully you won't need it. * indicates number for Medical service only – do NOT press * when dialling.